Home Amihan LPA Northeast Monsoon PAG-ASA Tail-End of a Cold Front Tropical Storm Urduja Weather PAGASA Severe Weather Update for Tropical Storm "URDUJA" (KAI-TAK) issued at 8:00 PM today, 14 December 2017. 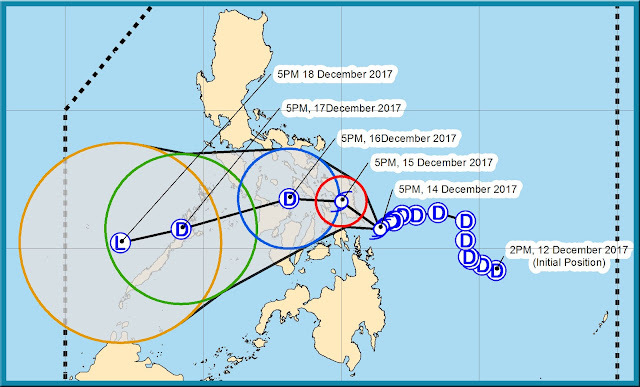 PAGASA Severe Weather Update for Tropical Storm "URDUJA" (KAI-TAK) issued at 8:00 PM today, 14 December 2017. PAGASA Severe Weather Update: TROPICAL STORM "URDUJA" REMAINS ALMOST STATIONARY AND CONTINUES TO BRING DAMAGE OVER EASTERN VISAYAS. Expected to make landfall over Eastern Samar tomorrow morning. Estimated rainfall amount is from moderate to heavy within the 400 km diameter of the Tropical Storm. Scattered to widespread rains is expected over Visayas and the regions of Bicol, Caraga and Northern Mindanao within 24 hours. Residents in these areas are alerted against possible flashfloods and landslides. Fisherfolks and those with small seacrafts are advised not to venture out over the eastern seaboard of Bicol Region and in the seaboards of Visayas due to rough to very rough seas associated with the approaching Tropical Storm. PAG-ASA Weather Update issue 5:00 PM today, 15 December 2017. PAG-ASA Weather Update issue 5:00 AM today, 15 December 2017. PAGASA Severe Weather Update for Tropical Storm "URDUJA" (KAI-TAK), 14-15 December 2017.